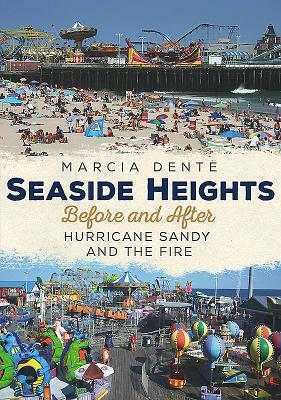 This beloved shore town of Seaside Heights was battered by Superstorm Sandy in October 2012, and one year later, in 2013, it suffered a major fire that destroyed the south end of the boardwalk. Notwithstanding these challenges, recovery is strong and the future of Seaside Heights grows brighter as each day passes. The boardwalk was re-built stronger than the one that Sandy splintered and rises slowly from the ashes of the horrific fire. After Governor Chris Christie visited the site of the destruction, he said, "We'll rebuild it." However, for those who recall the way things were, it won't be the same, as many of the iconic structures that made it what it was are now gone and washed into the ocean. With characteristic resilience and strength, Seaside Heights did rebuild, and came back stronger. "Confronting a storm is like fighting God. All the powers in the universe seem to be against you and in an extraordinary way, your irrelevance is at the same time both humbling and exalting." --Francoise LeGrande, The Quotable Sailor.